With a wondrous aura of euphoria and intoxicating desire with a hint of fascination comes new footage concerning the campaign of Halo 4. Quickly debuting only mere moments after the commission of this years Entertainment Expo, audiences both on the floor and out were greeted by the UNSC Infinity being swallowed by a beam similar to the beam that consumed UNSC Forward Unto Dawn. Seconds thereafter Master Chief was met by the descending Infinity as it cried distress calls, and not soon after a colossal entity hovered above Master Chief and pursued Infinity. 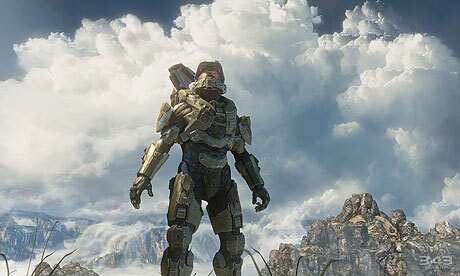 Master Chief's journey begins anew on unknown terrain. The airspace above Master Chief is aflow with Covenant ships and other unrecognizable ships as they too seem to follow the downed Infinity as Master Chief treks through a jungle with his redesigned Battle Rifle and aesthetically upgraded Assualt Rifle. Similar to Halo 3's first singleplayer mission, Master Chief walks through tight jungle corridors and is met with a Elite and Grunt scout force. Easily tackled down by munitions from his Battle Rifle, all enemies but the Elite fall. Saved by a flip of a coin, a lunging Elite is disintegrated by a beam similar to the beam ejected from Halo 3's Sentinel bots. Cortana, warning Master Chief of unknown land based creatures soon to follow, seems edgy but not yet rampant as indicated in the trailer following the demo. Master Chief, firing his Battle Rifle at the now identified Forerunner enemies, is met by retreating forces only to be followed by a new encounter. After being tackled by a daunting Forerunner enemy revealing a fiery skull, Master Chief retaliates and pushes back the Forerunner only to find that the Forerunner has an aid. A small enemy resembling a rotocopter protects its host with a shield similar to the Covenant shields in previous installments. Dispatched after a heated encounter, Master Chief proceeds on through the foggy and visually prohibitive environment. Cries from Infinity personnel reverberate through Master Chief's helmet as many Forerunner enemies, the same enemies retreating earlier, ready to attempt to overwhelm the super soldier. A new weapon of interest has been shown and is of Forerunner origin. Named the "Scattershot," Master Chief utilizes this armament to literally burn a Forerunner enemy to ashes. This weapon is also the source of the cause of disintegration of the Elite seen at the beginning of the demo video. Be minded that Halo 4 is hitting store shelves November 6th, 2012. Keep an eye out for additional Halo 4 footage in the upcoming hours and days, for promised Spartan Ops and Multiplayer footage is to be shown on the demo floor. As of now, Halo 4 is looking beyond promising and will deliver more than possibly all of the Halo community is expecting from the upcoming blockbuster.